The Leelanau Historical Society was recently given a donation by Theresa Shaub and her son-in-law, Greg Risbridger. 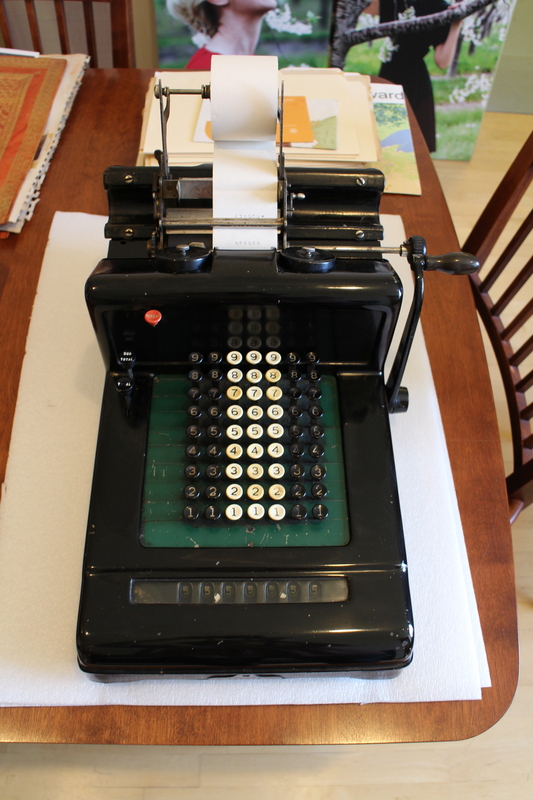 The donation was a 1915, adding machine from Burroughs Adding Machine Company in Detroit, MI. It was found at the Lake Leelanau Farmers Co-op. The Farmers Co-op was created by farmers in a fight to maintain just prices for their gains being shipped. They banded together to form the National Grange of the Patrons of Husbandry, in the 1870’s. Later the Farmer’s Co-operative was organized in the village in 1914. At its peak the membership reached fifty. Later the qualifications changed so as to give anyone who purchased merchandise at the store automatic membership. William Seward Burroughs, the father of adding machines, spent some years working as a bank clerk before coming up with this invention. By 1890, he had patented a machine and sent it out on a trial. By the mid-1890s, the American Arithmometer Company of St. Louis was actively selling the adding machine. In 1904, the American Arithmometer Company moved to Detroit and in the next year, the company name was changed to Burroughs Adding Machine Company. The official name of this machine is a Burroughs Class 3 Adding Machine It has a full keyboard that is manually operated. The metal frame is painted black, with a green metal keyboard. There are five columns of black and white plastic keys, and the crank on the right operates the machine. The machine is marked on the back of the keyboard with a line drawn through the letter “O” for Burroughs. A special thanks to Don Blumenschine who cleaned the adding machine and researched its history.